Exam rules: You may use only a writing instrument and your �cheat� sheet while taking this test. You may not consult any calculators, computers, books, nor each other. Answer the multiple-choice questions (problems 1 – 10) by marking your answer on the attached pages. For each multiple-choice question (problems 1 – 10), select only one answer. Questions with more than one answer selected will be considered incorrect. Problems 11, 12, and 13 must be answered in the blue exam booklets and need to be well motivated and expressed in terms of the variables used in the problem. You will receive partial credit where appropriate, but only when we can read your solution. Answers that are not motivated will not receive any credit, even if correct. At the end of the exam, you need to hand in your exam, the blue exam booklet, and your �cheat� sheet. All items must be clearly labeled with your name and student ID number. If any of these items is missing, we will not grade your exam, and you will receive a score of 0 points. Which of the following statements is true for two balls thrown in the air with the same speed at different angles with the horizontal? Ignore air friction. c The ball making the steeper angle spends more time in the air. c Both balls hit the ground at the same time. c moving at constant velocity. c the motion is irrelevant. c there is a downward force on the car. c there is an upward force on the car. c there is a sideways force on the car. c increases with increasing mass. c decreases with increasing mass. c is independent of mass. Consider three blocks with masses M1, M2, and M3, arranged as shown in the Figure below. An external force F is applied to the large block (M3) so that mass M1 does not move with respect to mass M3. Ignore all forms of friction. What is the acceleration of mass M3? Express your answer in terms of the external force F and the masses M1, M2, and M3. What is the net force on mass M1? Express your answer in terms of the external force F and the masses M1, M2, and M3. What must be the magnitude of the external force F in order to ensure that mass M1 does not move with respect to mass M3? Express your answer in terms of the masses M1, M2, and M3. What will happen to the position of mass M1 with respect to the position of mass M3 when the magnitude of the external force is smaller than the value calculated in (c)? What will happen to the position of mass M1 with respect to the position of mass M3 when the magnitude of the external force is larger than the magnitude of the force calculated in (c)? 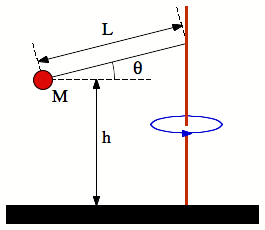 A sphere of mass M is attached with a string of length L to a rod. The sphere is carrying out a circular motion around the rod. When the sphere has a speed v, the angle between the string and the horizontal plane is q and constant. The height of the sphere above the ground is h.
What is the horizontal component of the net force acting on the sphere? Specify both magnitude and direction. Express your answer in terms of v, L, M, and q. What is the vertical component of the net force acting on the sphere? Specify both magnitude and direction. Express your answer in terms of v, L, M, and q. Use the answer to (a) to express the tension T in the string in terms of v, L, M, and q. Also, use the answer to (b) to express the tension T in the string in terms of v, L, M, and q. Use the two expressions for the tension obtained in (c) the find a relation between v and q and use this relation to determine what happens to q when v increases. What happens to q when M increases? At one point in time, the string breaks. How long after the string breaks will the sphere hit the ground? Express your answer in terms of h, v, L, M, and q. Two blocks, made of different materials, are connected together by a thin cord. They slide down a ramp include at an angle q to the horizontal as shown in the Figure below. The lower block has a mass m1 and the upper block has a mass m2. 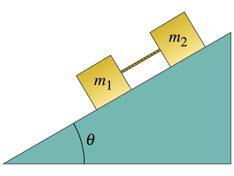 The coefficients of static and kinetic friction between the blocks and the ramp are ms and mk, respectively. a. What is the normal force acting on block 1? Express your answer in terms of m1, m2, q, ms and mk. b. What is the normal force acting on block 2? Express your answer in terms of m1, m2, q, ms and mk. c. What is the acceleration of block 1? Express your answer in terms of m1, m2, q, ms and mk. d. What is the tension in the cord? Express your answer in terms of m1, m2, q, ms and mk.